The Construction guide provides expert legal commentary on key issues for businesses. The guide covers the important developments in the most significant jurisdictions. Atkin Chambers is a leading set of barristers, based in London, with an international reputation for providing advocacy and advice on cases concerning domestic and worldwide infrastructure project development and disputes. Along with this broad area of practice, members have extensive expertise and experience in complementary areas such as energy, information technology, professional negligence, shipping and also in general commercial law. Most of Atkin Chambers’ work involves representing clients in Court or in domestic and international arbitration proceedings. In addition, clients will frequently seek advice during the earlier stages of projects, for example, in relation to PFI issues, European procurement law, or drafting contractual obligations. Complementing its reputation in the UK, where members act on many landmark and high-profile cases, Atkin Chambers has embraced the opportunities presented by the international market, being the first set of chambers to be awarded the Queen’s Award for Enterprise – International Trade in 2005 for a period of five years. Barristers act for clients all over the globe. Members are authors of authoritative and influential texts including the Building Law Reports, the International Construction Law Review and the Construction Law Journal. Edited in Chambers since 1959, and with the new edition published in 2015, Hudson’s Building and Engineering Contracts is the seminal work on the law relating to building and engineering contracts. The purpose of the Construction Guide is to address the key features of construction litigation, arbitration, and practice in each of the jurisdictions reviewed. 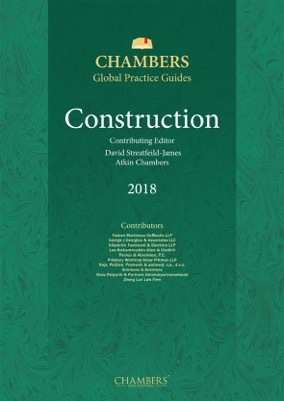 Organised on a jurisdiction-by-jurisdiction basis, each chapter has been contributed by specialist construction practitioners in response to questions prepared by members of Atkin Chambers, a leading set of London barristers’ chambers specialising in construction, engineering, infrastructure, and utilities disputes, together with a wide variety of related practice areas. By doing so, the editors hope to give the practitioner an introduction to the manner by which participants in the construction industry enter into contracts; the means by which construction dispute resolution is organised; and the approach of each jurisdiction to those problems which are common to construction disputes the world over.